← PALNYC + NYC22 + ProHoops = An Event Not To Be Missed! You Oughta Be in Pictures. I’ve Got Movies On The Brain. This week was all about movies. I ran into Bobbito Garcia on the L train Thursday. 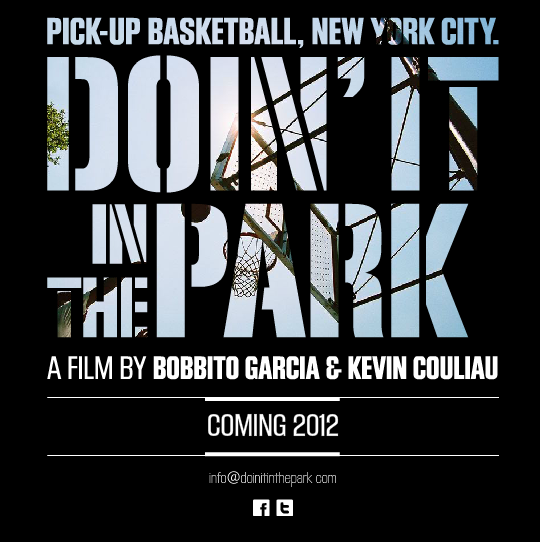 He’s in the final stages of completing his movie, Doin’ It In The Park, which chronicles the history of pick up basketball in New York. If you’re not familiar with Bobbito, he’s been on the street ball scene for years. In addition to being nice on the court, he’s also nice on the turntables, and on the mic (he’s been a sports commentator for years). Doin’ It is a co-production with Kevin Couliau, his production partner, and is set to be released this summer. Bobbito hit me with a flyer and sticker for his flick (love the fact that he’s still doing it hand-to-hand), and was out. Two stops later, I’m talking to Olivier French, who is screening a short film he premiered at Cannes last year in the Short Film Corner. Black Box will have it’s official NYC premier at the After Set Film Program at the Tribeca Grand Hotel Saturday, April 21st at 7pm. And I’ve been talking to the folks over at Harlem Stage, as they prepare for their 30th Anniversary Gala. We’ve been working with them to prepare the video component of the Gala, which will consist of vignettes of performances from artists, large and small, that Harlem Stage touched in their 30 years. I’m still waiting to hear whether the project I’ve been working on has been accepted into Cannes this year, so stay tuned for more movie-related updates!